For Year 2019 we wish you all the best and interesting encounters with the labyrinth. Dipl. Ing. 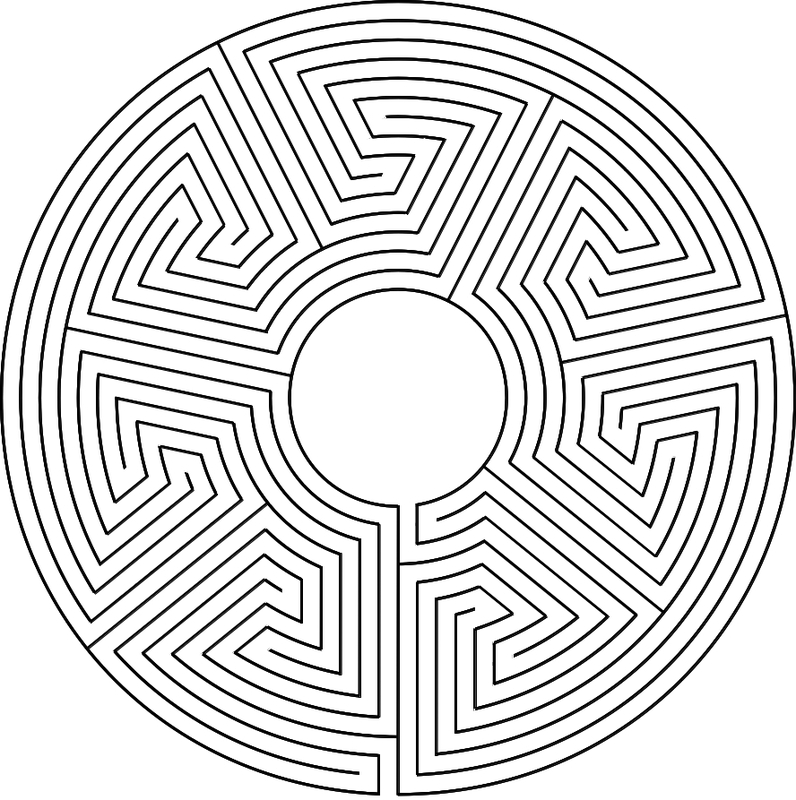 Norbert L. Brodtmann uses the curvy and tortuous path in the Chartres Labyrinth to demonstrate the possibilities of the robot arm technology he has developed. He transforms the straight lines and radii of the path elements for the way in the Chartres labyrinth in Bezier curves, which he draws in inverse kinematics by a robot. I was able to provide him with the necessary coordinates for the trajectories from my true-to-scale drawings of the Chartres Labyrinth. 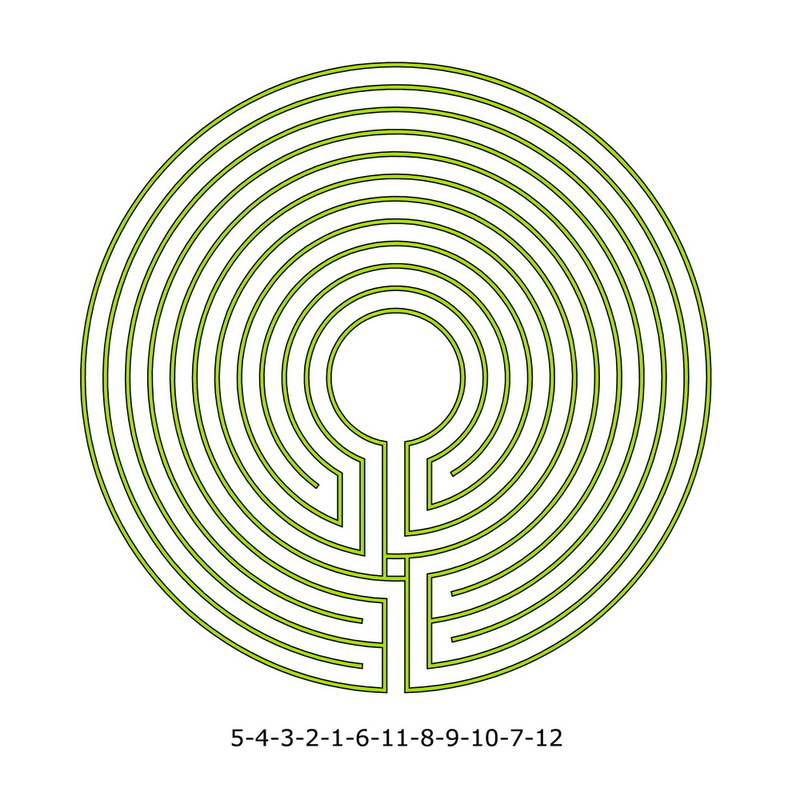 How long is the path in the Chartres labyrinth? In the previous articles on this topic, I have already explained the method of the stamp-folding calculation brought into play by Tony Phillips. Now it should go on here. Namely, it is possible to generate further variants of labyrinths by simply rotating the polygon used. I take again the net with the polygon from the last post on this topic (part 2). 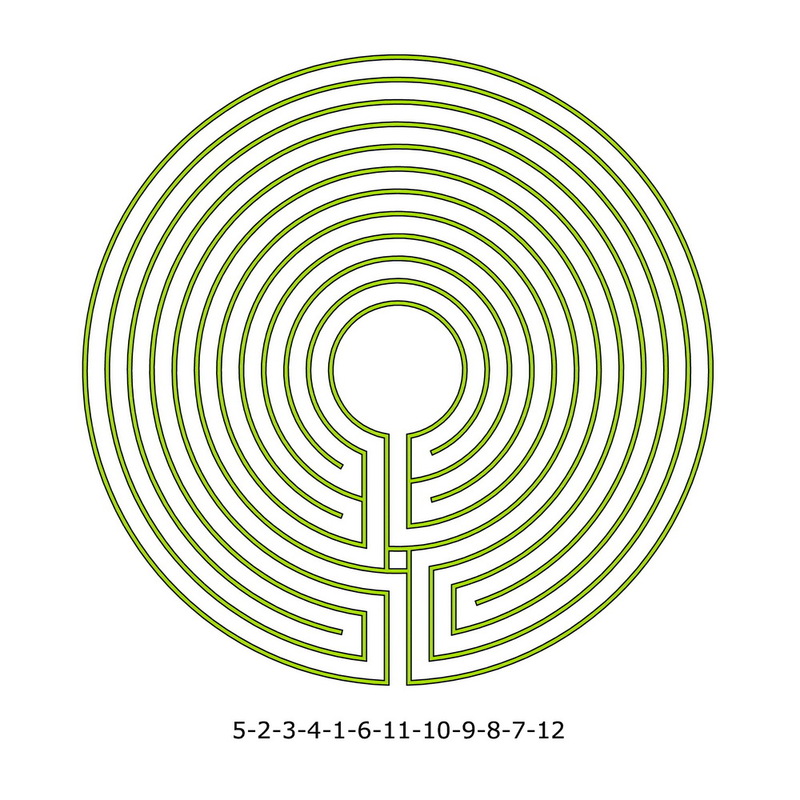 This diagram can be used to create four different labyrinths. Two directly (line 2 and 3), the other two by a simple calculation. Other constellations can be gained by rotating the network 12 times by 30 degrees. Or in other words, it’s just like changing the clock for the summer or winter time. Since only interesting labyrinths are of interest here, I omit all positions where the lines would point to the first and / or last circuit. So from the 12 you should not reach the 1 or the 11. Only the “times” are interesting, which point farther away, that is, run more sharply. That would be in the above net the 1, 5 and 6. So I turn only to these times. In other words, I bring the 1, 5, and 6 into alignment with the 12. 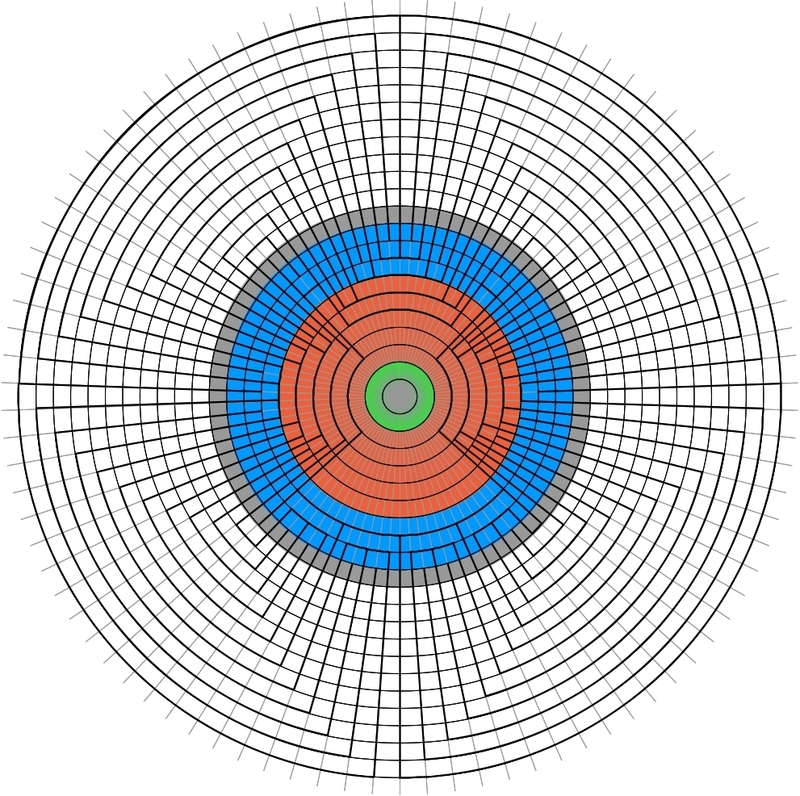 I turn the net by 30, 150, and 180 degrees. 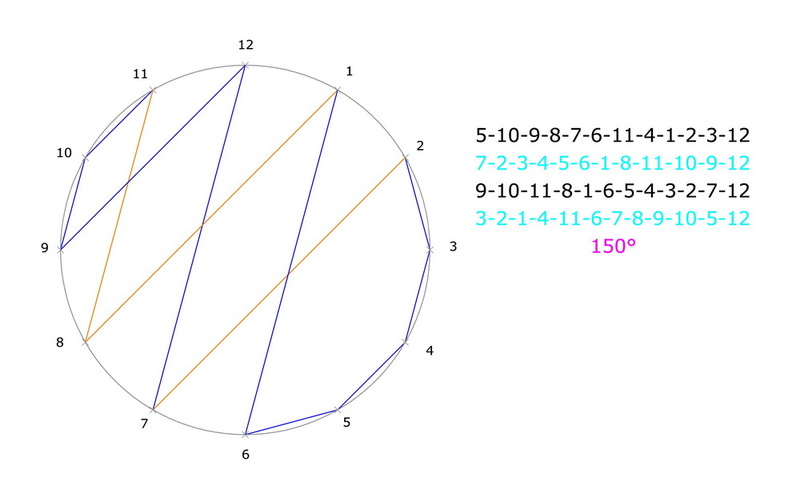 To rotate is the net with the polygon, the numbers stay in place. I get four completely different path sequences than in the original above. I get four new variants again. Here I just get a different order of the sequences than in the original polygon. So there are no new variants, just another arrangement. This is because the rotation of 180 degrees corresponds to a symmetrical reflection. It is not always possible to find new variants. 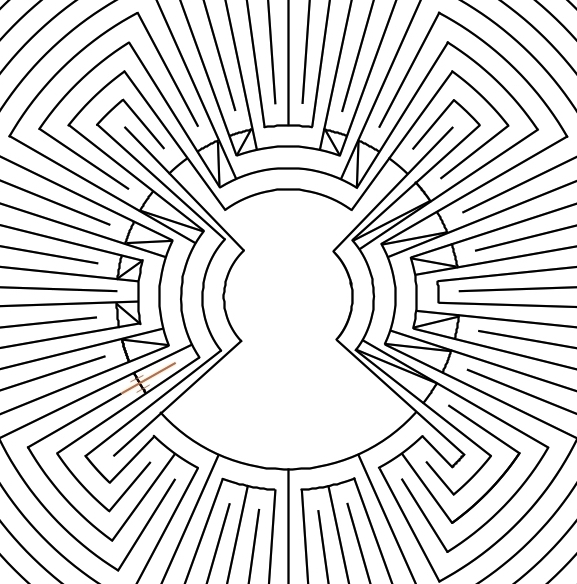 With the help of this net I have generated a total of 12 different path sequences for 12 new labyrinths. The path sequences can be directly converted into a labyrinth drawing. Again we deal with the simple, alternating, transit mazes, defined by the New York Professor of Mathematics Tony Phillips. In his calculations he ascertains a number of 1014 theoretically possible variants of interesting 11 circuit labyrinths (12-level mazes). 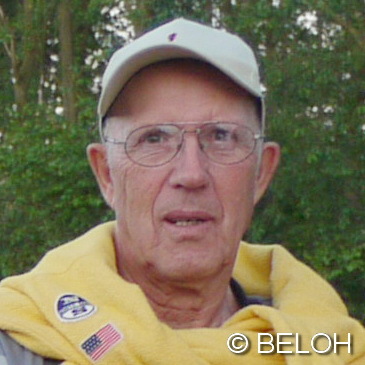 He also describes a simplified method for calculating these variants, which John E. Koehler developed in 1968 to solve a related problem of stamp-folding. The following pictures should explain this method. To this I first use the already known path sequence for the 11 circuit labyrinth which can be generated from the basic pattern, namely: 5-2-3-4-1-6-11-8-9-10-7-12. The path sequence must begin with an odd number and then the row must be composed of even and odd numbers alternately. The center is named with “12”, as it is the outside. 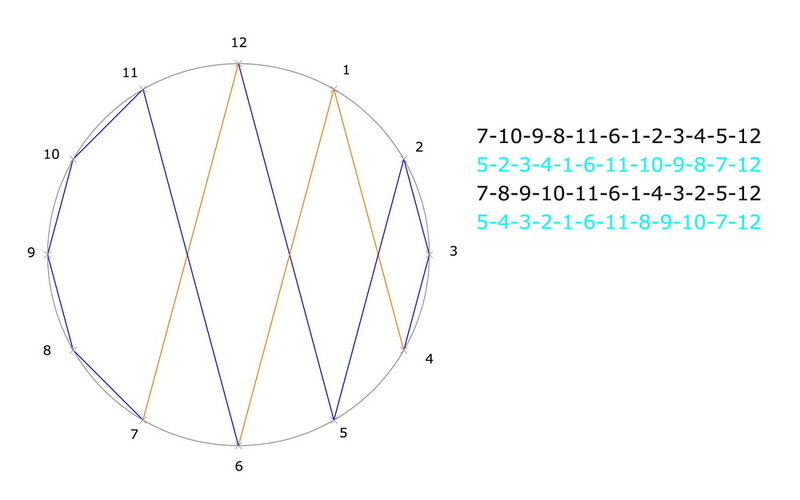 I draw a circle and divide it into 12 parts, as for a dial. Now I have to connect all points with lines, but same-colored lines must not cross. I start with blue in 12 and go to 5, 2, 3, 4 (Fig. 1). Then from 4 to 1, thereby I change the colour (Fig. 2). 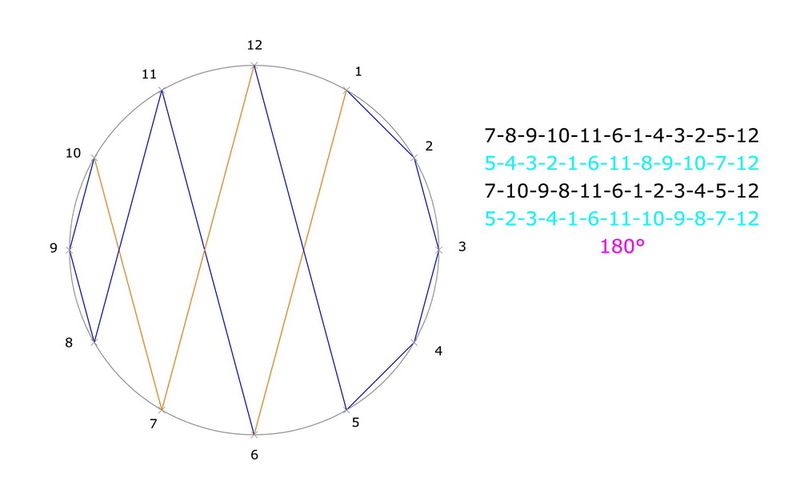 I continue with 6, 11, 8, 9, 10 (Fig. 3). 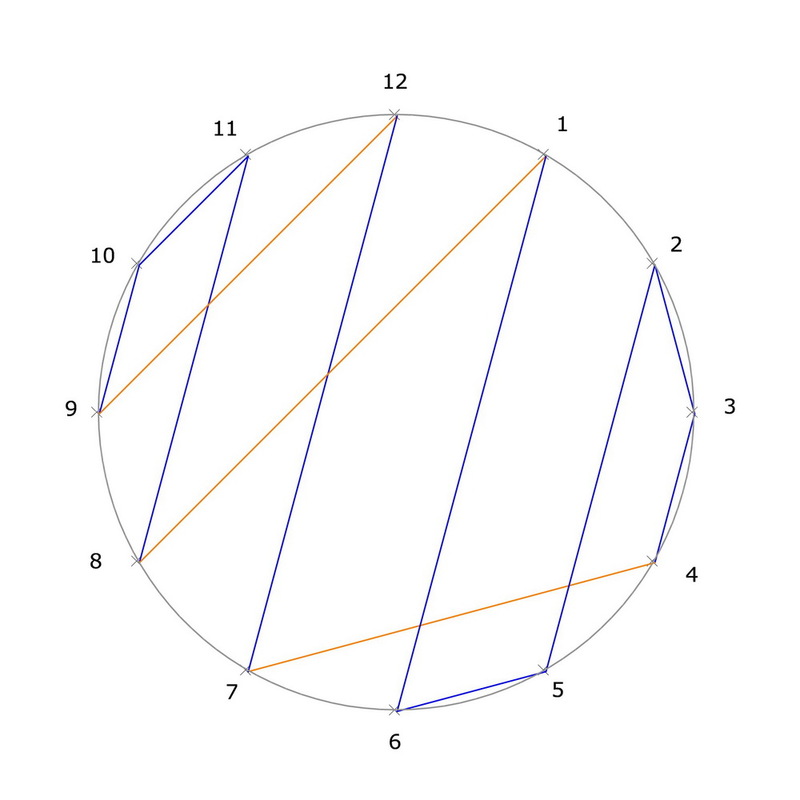 I again change the colour and complete the lines from 10 to 7 and 12 (Fig. 4). But you can do it differently. 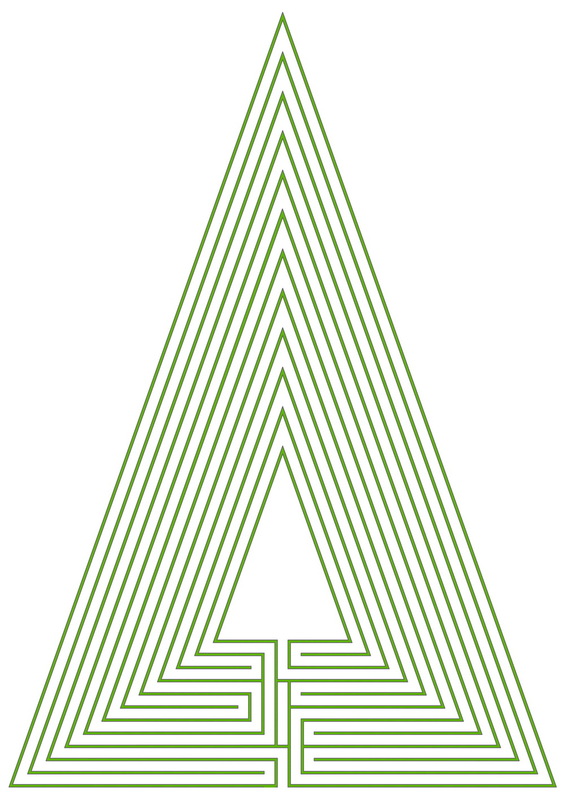 For example, draw all the lines first in one color and then the intersecting ones in the other. Here again, the same-colored lines should not cross each other. But more than once, as long as they are different (see 4 – 7). 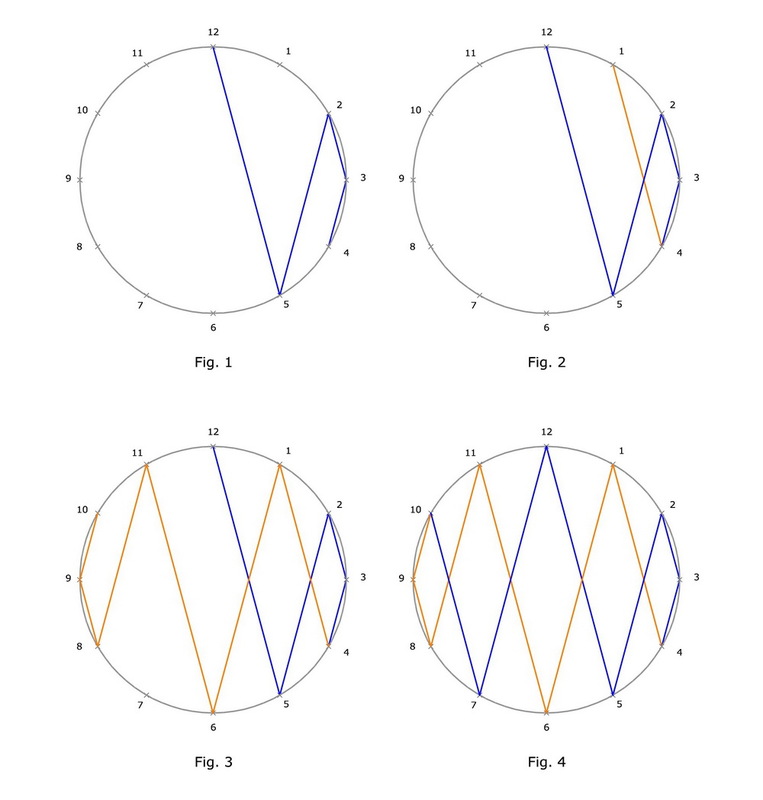 But since we are looking for new labyrinths, we now go the opposite way: We draw a network of 12 lines, which connects all 12 points according to the above specifications and derive from this the path sequence. I write the first path sequence in line 2 (here in blue), starting at 12 and reading the lower digit, here 5. This is the beginning of the path. Then I follow the polygon until I land at 12 again and get: 5-2-3-4-1-6-11-10-9-8-7-12. That’s the original. Now I go backwards and write the path sequence in line 3. So from 12 to 7, etc. That gives: 7-8-9-10-11-6-1-4-3-2-5-12. This is the complementary to the original. 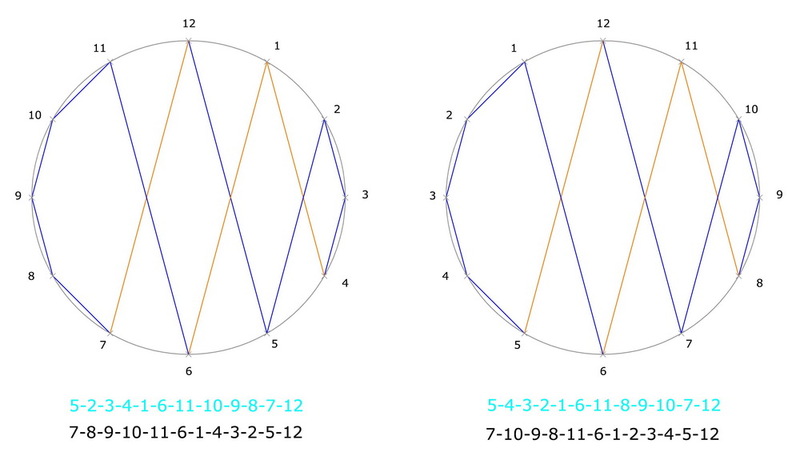 I receive the lines 1 and 4 by arithmetic. I add the corresponding numbers of each row to “12”. In line 4, I get the dual to the original. In line 1, I get the complementary to the dual. I verify this by comparing the numerical columns thus obtained with the others in “reverse”. 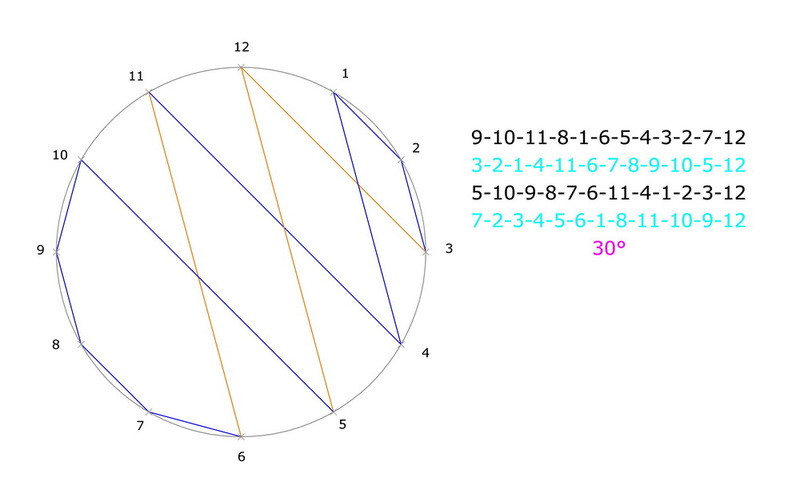 This applies to the lines 1 and 4, as well as 2 and 3. This is reminiscent of what has been described before when dealing with the dual and complementary labyrinths (see Related Posts below). But there are alternatives. I turn the dial around, write the numbers for the 12 dots to the left, counterclockwise. The left side shows the dial as before. I start at 5, count to 12 and get the original. Then I start at 7 and count again to 12 and get the complementary to the original. Now the right dial. I also start at 5 and count to 12 and so get the dual to the original. Then again from 7 to 12 and I get the complementary to the dual. What should the blue written path sequences mean? 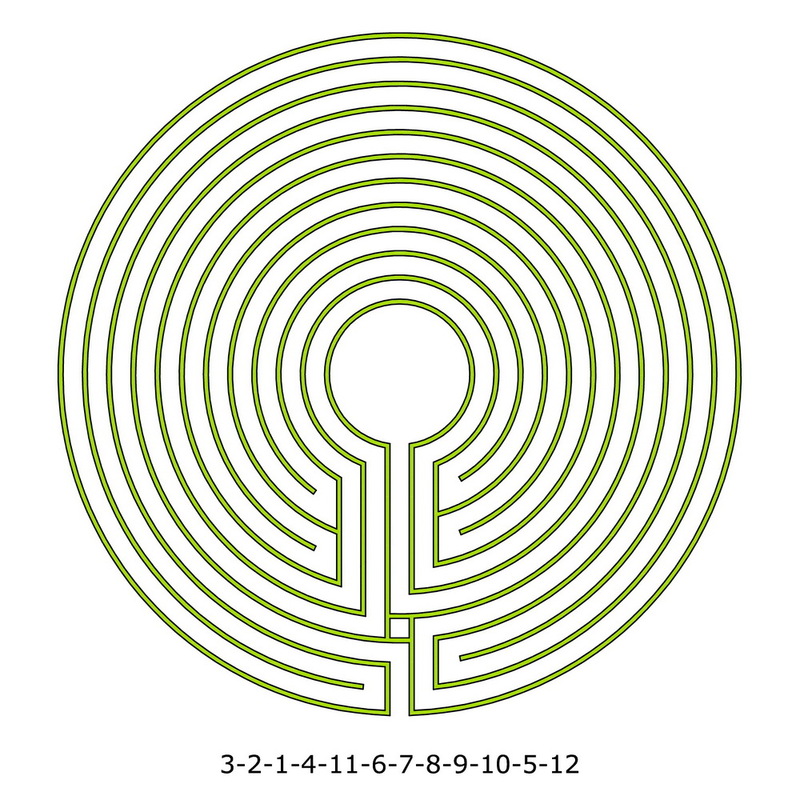 They point out that the entry into the labyrinth can be placed on the same axis as the entry into the center. Here on circuit 5 and 7. 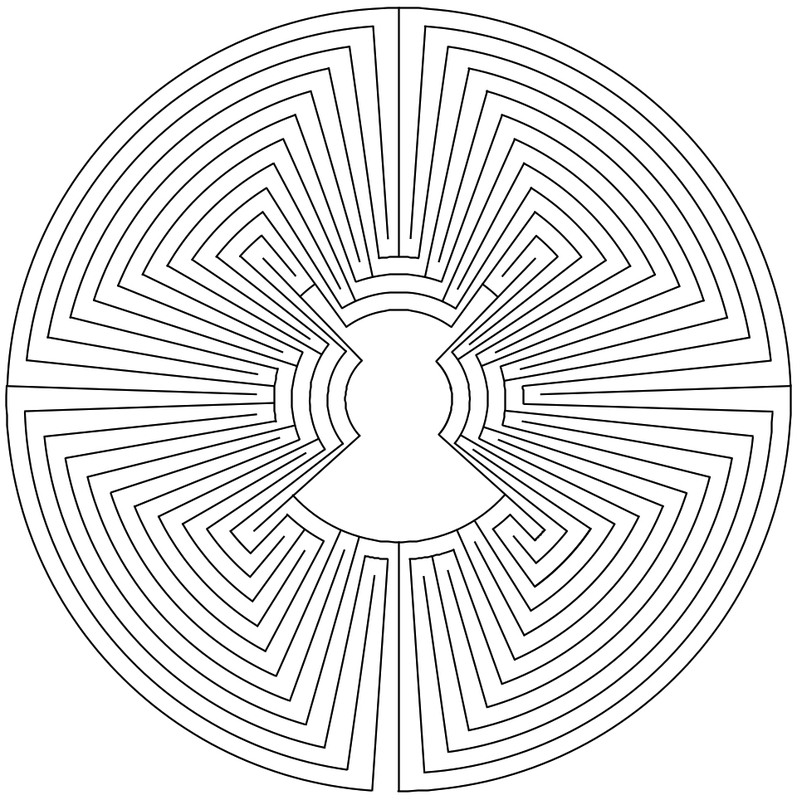 Walter Pullen calls this that a labyrinth layout is mergeable. 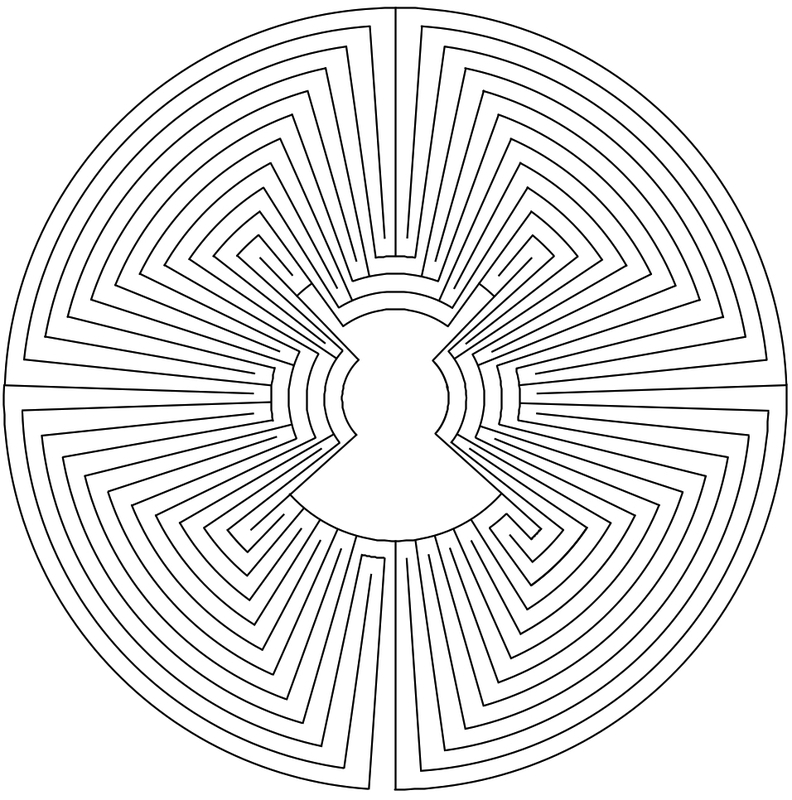 This allows you to construct a small recessed spot in the labyrinth, which some name the heart space. Especially in the concentric style, this can be implemented well. They have a different pattern of movement than the upt to now known labyrinths. In addition, we see 6 turning points for the circuits. 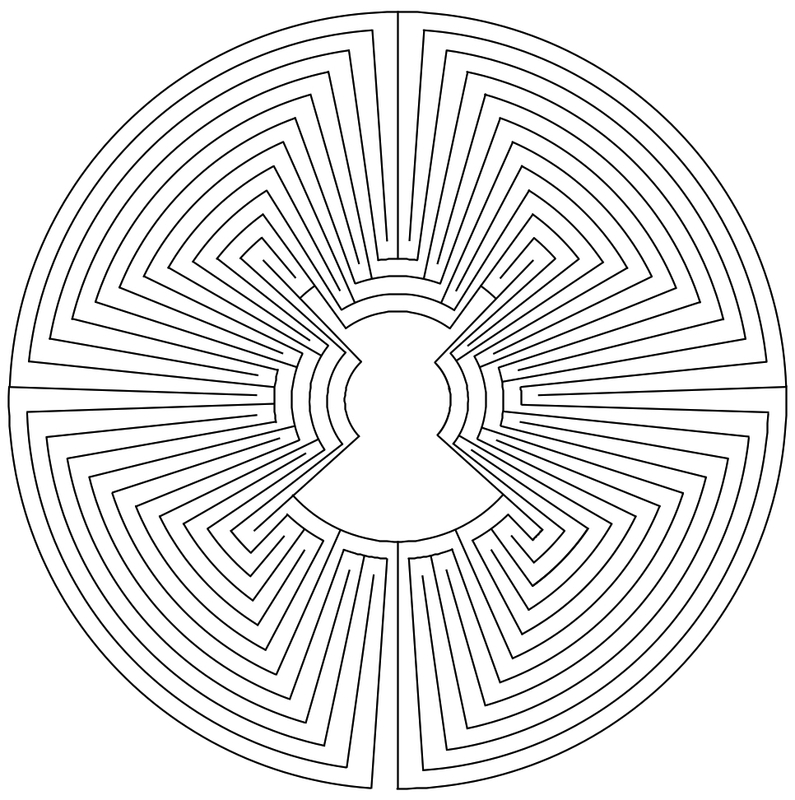 This is the dual to the previous labyrinth. Again, there is another “feeling”. Who makes the beginning and builds such a labyrinth? The other two paths sequences also result in new labyrinths, which I don’t show here. These belong to the remaining 1000 variants that are theoretically possible for 11 circuit labyrinths.